A few years ago I was inspired to make some crazy burgers. If you can make a veggie burger, why not try to make other fun burgers that contained all the ingredients? The real benefit here would be freezing them for a quick weekday meal. Like say, a chili burger where the burger had the cumin, chili powder and beans mixed right in. Mix chicken breast, broccoli, egg and 4 tablespoons of teriyaki. If its too runny to form into a patty, add a tablespoon or two of panko. You can use more, but after 2-3 its gets bready and weird. Form into patty shapes on top of parchment, wax paper or aluminum foil. Preheat grill or non-stick frying pan. Lay burgers on grill and peel off paper. Spread a little teriyaki on the top of the burgers. Leave it alone for a while to cook and firm up. Flip and add a bit more teriyaki. Serve on bun of choice with some extra teriyaki in lieu of ketchup. A lettuce leaf may be nice alternative for the bun, but I haven’t tried it. *We grind our own chicken breast and freeze it into nice convenient 5 oz. vacuum sealed packs, so when I made this recipe I actually used 15 ounces. An extra ounce here or there won’t hurt anybody! Hey Jerry, it was great to meet you guys at dinner that night….and your wine was no slouch, that was some good stuff! Will definitely keep in touch and will let you know if we run into DJ troubles! 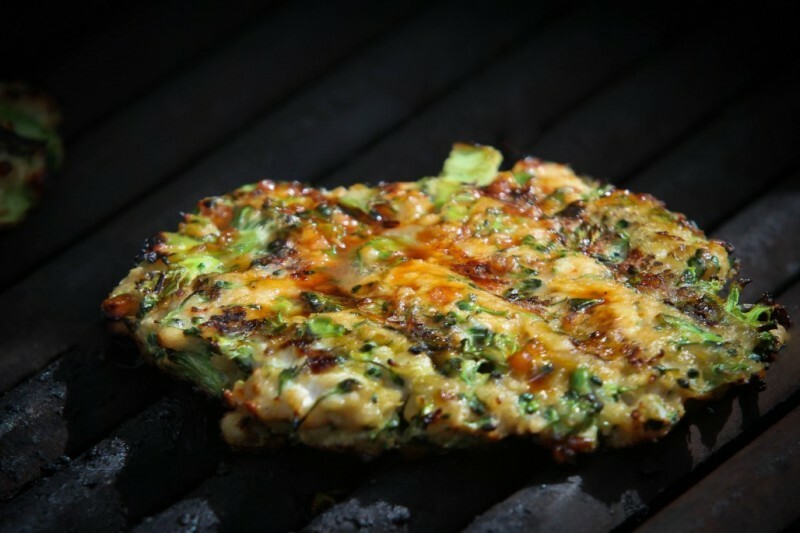 Let me know if you make the burgers, and also share the artichoke recipe if it comes out good! This is simple? Well, maybe for you! The simple part would be pulling them out of the freezer on a busy night after they are already made! It does look healthy and delish, though! And, what I really love, is that you had this idea and worked with it until you got something you liked. I love the idea of a chili burger… somehow it must be possible to push a bowl of chili into a hamburger form and have it stay in that form when it thaws out. What would it take? It really gets me thinking… It would have to be a meatloaf type of chili. Or, layered somehow. That might work… or hollow with the shell a burger with chili spices and tomato paste and beans and the inside some juicy vegetables. NO – maybe we just made it. What do you think? Beans mashed into raw hamburger meat with chili seasonings and tomato paste and onion and garlic and made into pattys. I think it would work. Love the way you think. Funny you commented on this tonight, I thawed out my last 2 of ’em for dinner about an hour ago! Thanks for the props and your continued support, its nice to know someone out there is listening (besides the spam robots that hit the site often!). This is a crazy burger too but, it’s wonderful. I love it. …now those sounds insanely good!